The Taiwan protests aren’t a sign of “winter” for Taiwan’s democracy – they are democracy. In China’s 100-year history of seeking constitutionalism, there’s been wave after wave of student-led democracy protest movements. When the Republic of China ruled mainland China, the Chinese Communist Party (CCP) made use of the Nationalist Party (KMT) constitution, passed down from Sun Yat-sen, which allowed marches and demonstrations. The CCP actively planned and participated in a variety of “anti-tyranny” and “anti-authoritarian” student democracy movements. In the end, the CCP chased away the KMT and established a new China. After arriving in Taiwan, the KMT learned from this painful experience: it implemented a long period of martial law and oversaw the “White Terror.” But ultimately the KMT couldn’t restrain the seeds of democracy that had already begun to sprout. Taiwan moved gradually from a military government and a provisional constitution toward full constitutionalism. Of course, this wasn’t a walk in the park. Although Chiang Ching-kuo made great contributions, without protests from figures outside the party, without the Taiwanese students walking in the forefront and without a fearlessly advancing Democratic Progressive Party (DPP), Chiang Ching-kuo would not had changed course and released his hold on power. He would at most have been another dictator. One of the causes of the million-plus “red shirt” protest was that Chen Shui-bian ignored the necessity of Taiwan’s economic development and refused to improve relations with mainland China. And the reason for this current protest against Ma Ying-jeou is that Ma ignored the fate of Taiwan’s people and got too close to the mainland by signing a service trade agreement. As a result, these two democracy movements have moved beyond the scope of Taiwan. Depending on whether you define yourself as being “Taiwanese” or “mainland Chinese” or some combination of the two, when you look at these movements you will come to different conclusions. Taiwan’s leader Ma Ying-jeou has actively sought further opportunities for economic cooperation and promoted free trade so that Taiwan will not be alienated from the Chinese mainland (and, more importantly, the world). This might be the fastest way to ensure Taiwan’s economic development in the short term. Leaving aside Taiwan, even when it comes to the United States and Europe, who hasn’t scrambled to develop economic and trade relations with China? If Taiwan gives up the opportunity that comes from proximity to China, in 10 years, will Taiwanese people even be able to afford a tea egg from the mainland? But the students and the citizens who came to support them (including the behind-the-scenes DPP) also have their reasons. In the face of a strong (and not fully marketized) mainland China, too close of cooperation has the potential to change Taiwan or even to drown Taiwan. To keep “equal footing” with the Chinese mainland in economic and trade exchanges (such as the service trade pact) is easier said than done. The two sides are not in the same weight class. In addition, restrictions on certain industries and the institutional gap will also increase the variables for Taiwan’s future. For example, with the opening of the printing industry of the two sides, the mainland can print books in Taiwan criticizing the island’s leaders, but can the Taiwan printing industry enter the mainland and break the barriers restraining free speech? The “China factor” makes things complicated. And added to this, we have the huge political differences between Taiwan’s two major parties. As a result, the opposition political party often tries to use street politics to gain an advantage and build up momentum for the next election. Yes, this has been a problem in Taiwan, but for no I’d like to talk about another issue: The mainland spectators standing on the sidelines. Regarding the Taiwanese students’ occupation of the Legislative Yuan, comments from Chinese scholars have been different from the comments made by the Western and Taiwan scholars. The Western scholars are mostly discussing the facts on the ground. From the beginning, the Taiwanese scholars discussed whether or not Taiwan needs the service trade agreement, and whether Ma Ying-jeou’s actions complied with the democratic process. But mainland Chinese scholars, whether for or against the protest, all carried a strong strain of idealism. They tried to analyze the issue using the theory of democracy, seeking a strategically advantageous position. They have one concern only: democracy. The scholars supporting the students wish that the “democratic force” of these young people could be like the Red Guards who gathered in Tiananmen Square during the Cultural Revolution. They want the students to overthrow Ma Ying-jeou, establish a “more democratic” Taiwan, and, in the best-case scenario, make Taiwan an “anti-communist base.” As for those who opposed the fierce action of the students, they believe that these students don’t recognize a good thing when they see it. According to this logic, the students are themselves destroying Taiwan, the only democratic seedling of the Chinese people, through their reckless actions. The students are actually destroying Taiwan’s democracy. Some people even have adopted a lament: This is the winter of Taiwan’s democracy! These scholars obviously only read some of glorious history of America’s democratic progress, but did not read the complete history of the United States. They don’t know that U.S. democracy developed not only through system reform and legal arguments, but also couldn’t have advanced without fierce struggles by the people at every step. We should not forget the day that Martin Luther King Jr. led hundreds of thousands of people, white and black alike, to form an impenetrable crowd in Washington, DC. American democracy has been developing for over a century and is relatively mature, but popular protests (including some radical, illegal actions) and the government use of force to disperse them have occurred many times. 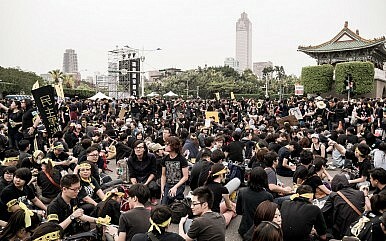 Some students and citizens in Taiwan were not satisfied with the service trade agreement and took to the streets. There were even some extreme actions, but this doesn’t necessarily mean there’s a problem. Which society has never experienced extreme behavior? Just recently, I saw some pictures of a bloody scene, and thought that there had been murder in Taiwan. Later, I learned where these pictures were from: locals in China were protesting against a PX project, and there had been violent clashes with the police. A democratic system cannot expect every single person and group to be well behaved and law-abiding, only enjoying some democracy through legislative debates and each ballot. Any democratic system allows demonstrations and marches by discontented groups. Under these circumstances, excessive behavior is not that surprising: for example, striking at the Legislative Yuan or occupying the field in front of the White House. The expression of the pros and cons of democracy comes in the government response to demonstrations and extreme behaviors! That is how you tell if it’s a democracy or not. Does the government practice tolerance and seek a compromise, solving the issue in accordance with the constitution, or does it heedlessly send the police to violently repress the protests, spilling blood and shutting out arguments and information? Democracy is not always romantic, and doesn’t always have the youthful beauty of the student protesters themselves. This is especially true in the democracies in Asia, Africa, and Latin America that never experienced an enlightenment period. These democracies often try to compensate for the lack of a historical movement of democratic enlightenment through various arguments and struggles after democracy has already been established. They must gradually perfect the democracy that they copied overnight. Taiwan’s democratic system is relatively mature, but the systems in Thailand and Crimea are not so fortunate. It is true that democracy has suffered a winter, but we shouldn’t forget: If winter comes, spring is not far off. And we should also remember that a winter for democracy doesn’t mean automatically bring spring for authoritarian systems. Concessions from legislative speaker Wang Jin-pyng led protestors to announce an end to their occupation of the LY. Taiwan: Ma’s AIIB DilemmaHow Hong Kong's Protests Will Shape Taiwanese PoliticsBeijing Watches the Taiwan ProtestsWhat Does the 1992 Consensus Mean to Citizens in Taiwan?Can a Taiwanese Be The Delegate of China’s 19th Party Congress?